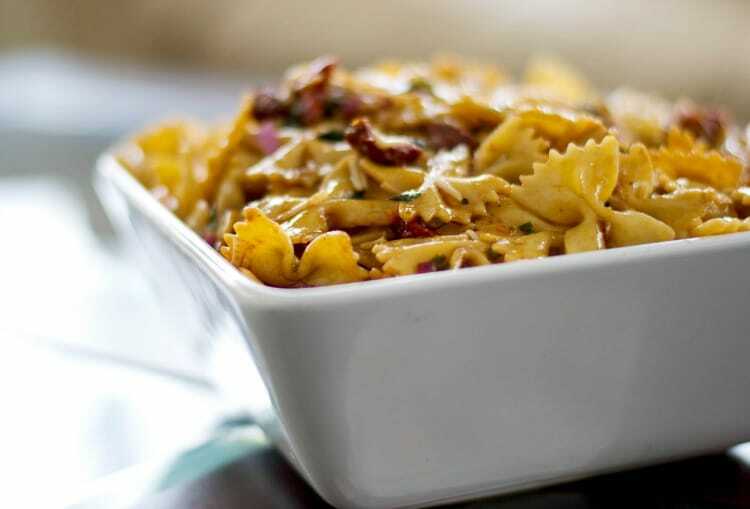 Sun Dried Tomato & Asiago Cheese Pasta Salad made with bow tie pasta, oil packed sun dried tomatoes, freshly shredded Asiago PDO cheese and basil in a balsamic vinaigrette. 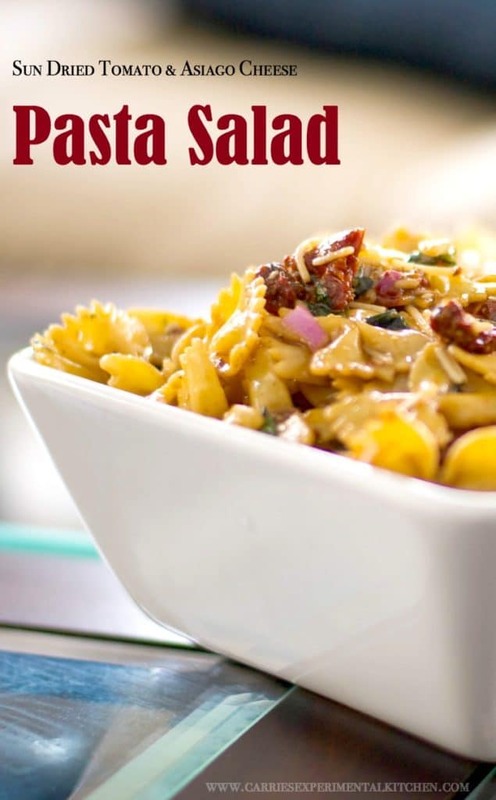 This Sun Dried Tomato & Asiago Cheese Pasta Salad is definitely a salad that I’m going to have to make again and again; especially since I only tasted a small forkful of it! Our cheerleading booster club was hosting a ladies night out event in December and I wasn’t able to attend, but I signed up to bring a salad. I wanted it to be vinaigrette based salad as it was going to be sitting out for a couple of hours and from what I was told, it was a huge hit. For this salad you’ll need bow tie pasta, sun dried tomatoes packed in oil, red onion, fresh basil, Asiago cheese, Good Seasons Italian Dressing mix and balsamic vinegar. I generally like to use fresh sun dried tomatoes instead of those packed in oil, but I figured I could use this oil to give the salad a little more flavor. ~Enjoy! 1. Cook pasta according to package directions, rinse under cold water and cool. Ooh, that looks so good and comforting. I love asiago cheese! I really like asiago too! What a tasty looking salad, and how great to find an oil-based pasta salad that can sit at room temp for a while. Bookmarked!